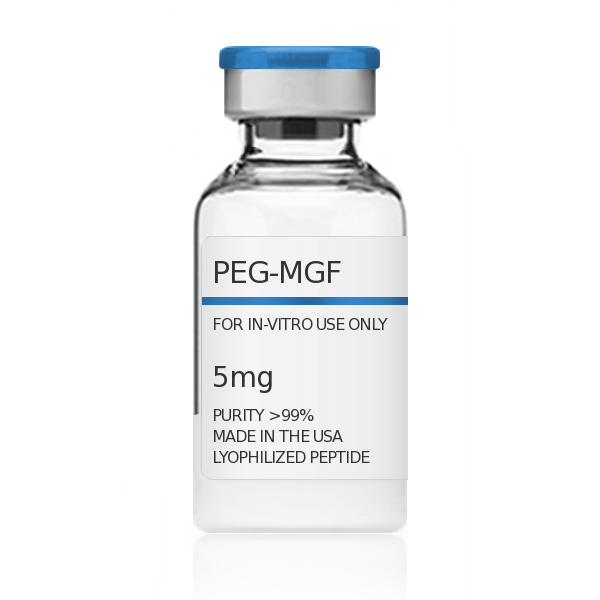 PEG-MGF is the Pegylated form of MGF (Mechano Growth Factor). MGF is a splice variant of IGF-1, which has been shown in vitro as well as in vivo to induce growth and hypertrophy in mechanically stimulated or damaged muscle. Insulin-like growth factor genes appear to have evolved from a single insulin-like gene. This gene can be detected in invertebrates and seems to cause anti-apoptotic effects by maintaining terminally differentiated cells. MGF contains the core protein encoded by the exons 3 and 4, as well as a specific insert encoded by a region of exon 5. GHPeptides™ PEG-MGF has a peptide purity level that exceeds 99.0% as determined by HPLC. This peptide was synthesized with no additives and is supplied as a white lyophilized (freeze-dried) powder. It is recommended to reconstitute the lyophilized PEG-MGF in sterile water, which can then be further diluted in other aqueous solutions. Lyophilized PEG-MGF although stable at room temperature for 3-4 weeks, should be stored desiccated below -18°C. Upon reconstitution, PEG-MGF should be stored at 4°C out of direct light for between 10-14 days and for future use below -18°C. Prevent repeated freeze-thaw cycles.